Singing was Slim's true passion and in 1949 RCA Records signed him to a recording contract and he had only modest success, also had appearances on the Louisiana Hayride. His first single “Love Song Of The Waterfall” was a hit selling over a half million copies. When “Indian Love Call” was released it put his music in full swing. In 1965 “More Than Yesterday” was a hit for Slim reaching in the top ten. 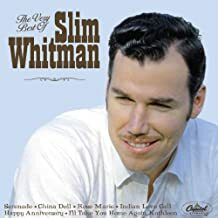 Slim Whitman lyrics represents a large variety of music with many beautiful songs they are always very entertaining. We specialize in classic country lyrics, if it’s old, it’s likely to be on this web site. Although Slim Whitman isn’t well known in the United States, those of us that are fans really enjoy his music. He has a tremendous range in his voice that is well suited for songs like “Indian Love Call”. Most of his songs have simple guitar chords and with a bit of practice we all can play them for our own pleasures.